Pavle Dešpalj's original composition Omaggio a Bellini has been arranged for cello and guitar by his brother Valter Dešpalj, professor of cello at music academies in Zagreb and Liechtenstein. A graduate from the Juilliard School, Mr. Dešpalj studied cello under Leonard Rose and chamber music with Felix Galimir and the Juilliard Quartet. Mr. Dešpalj has performed all over the world, held guest professorships at conservatories throughout Europe, and been an editor of cello music with major music publishers. My father, who was a very versatile musician, had a passion to learn how to play different instruments. He was in his mid-60s when he decided it was time for him to learn how to play guitar. My brother Pavle, a composer and a violinist, heard him practice a simple etude by Ferdinando Carulli, the well known guitar virtuoso, a contemporary of Vincenzo Bellini. That inspired him to compose a melody for violin in style of Bellini, using Carulli’s etude as an accompaniment. Soon a violin and guitar duo was heard in our house. I embraced the melody and gave it a title - “Omaggio a Bellini”. I was 14 years old at the time. Many years after, I performed the Dvořák Concerto in Catania, the city where Bellini was born and where he is worshiped. I wanted to pay him a tribute, so I played the “Omaggio” as an encore, accompanied by the orchestra’s harpist. After the concert a gentlemen approached me, introducing himself as the music critic, a specialist in Bellini. He exclaimed with excitement: "I know Bellini’s music thoroughly and cannot understand why I never came across this beautiful aria by his! Where did you find it?" Hearing that, I laughed, realizing that the only word he heard while I was announcing my encore was – “Bellini”! 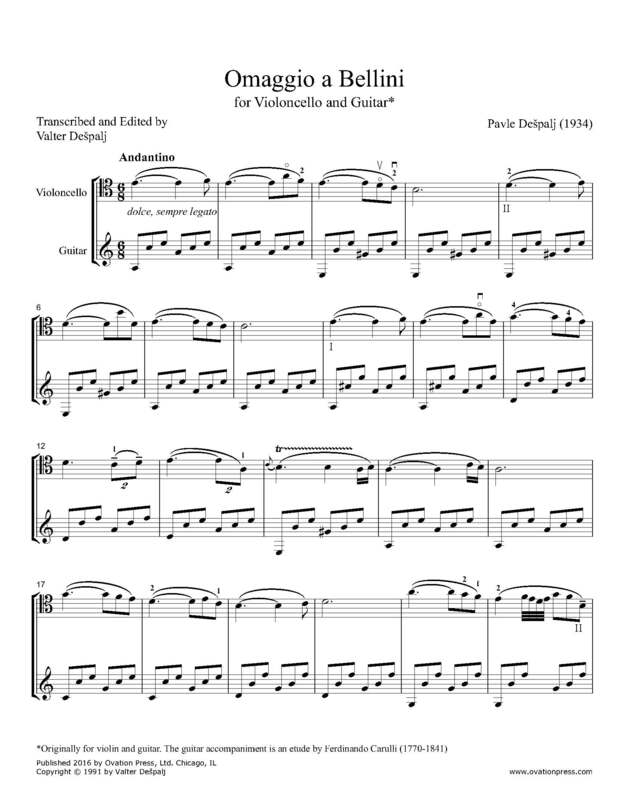 Download and print the score today to gain access to Omaggio a Bellini for cello and guitar from the Dešpalj brothers! Check out this arrangement of Pavel Dešpalj's original composition Omaggio a Bellini as performed by Valter Dešpalj (cello) and Istvan Roemer (guitar).